Mitt Romney: "I will reverse President Obama’s massive defense cuts. 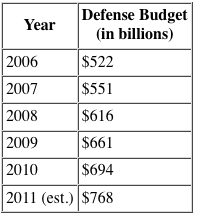 Time and again, we have seen that attempts to balance the budget by weakening our military only lead to a far higher price, not only in treasure, but in blood." Perhaps he means that President Obama "cut" negative $74 billion from defense spending over the last year. (Remember, a negative minus a negative is a positive.) Or maybe it's the word "massive" we should be focusing on. Could it be, perhaps, that Romney objects to spending on comparatively lightweight drones, instead of more massive aircraft carriers?